Eva Chance is used to being ignored by her family, apart from her frail grandfather, who she adores. So she's barely even surprised when they don't set a place for her at a dinner party. But when nearly everyone is ignoring her she grows increasingly concerned – and that's when she realises she's dead. Can she solve the mystery of her murder before either malevolent ghosts or human criminals can do any more damage to her family, aided only by Kyra, who bullied her when she was alive, Kyra's brother Kyle, and a ghost called Maggie she may or may not be able to trust? First things first, the characters here are very well-drawn. I liked the central trio of Eva, Kyra, and Kyle, and thought that Kyra in particular was very interesting as someone who was having to deal with guilt over the way she'd treated Eva before her death and fighting to prove to herself she wasn't a completely nasty person. I also really enjoyed Kyle, especially the way he interacted with his sister and with Eva, who he'd never really known before her death. I also thought the mystery aspect was really well handled and was racking my brains trying to work out who the human criminal was, and even if there was one, changing my mind continually as new developments occurred. The portrayal of the various supporting characters, most of whom were moderately unpleasant without anyone standing out as an obvious murderer, certainly added to the intrigue as well. That said, I thought the supernatural part of the book was a bit hit and miss in places. I never felt completely drawn into the world of the spirits and found the start of the novel rather slow paced as Eva took so long to realise that she was a ghost. I also thought the two other teens were remarkably quick to accept the existence of ghosts, with Kyle's initial shock not lasting anywhere near as long as I'd have expected. 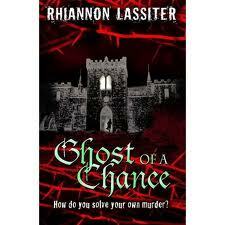 Once things started moving more quickly, though, and the House was opened up to the public with Ghost Walks taking place as Eva, Kyra and Kyle desperately tried to solve the mystery of Eva's death with more and more dangerous occurrences happening, I was really keen to find out what was going on and enjoyed the imaginative way Rhiannon Lassiter ended the novel. Recommendation to fans of both mysteries and supernatural novels.